We love ceviche just about every way. This past spring we enjoyed some variations with juices and coconut milk in Bogotá, Colombia. In my opinion, Colombia has some of the tastiest ceviche. Ours today has three different seafood in it, for taste and texture. We chose to leave the onions out of this dish this time, and we did not miss them, actually. It is very important to get enough lime juice and the proper balance of spices. I am not a big fan of adding spices in which the dish is marinating, rather we prefer to sprinkle cayenne and some turmeric over it. Mix it well and cover it and place it in the refrigerator for a couple of hours, stirring it every 20 minutes. We always make a little extra for a snack or lunch the next day. Note: if your seafood is frozen, please allow to thaw naturally, not in the microwave. Take a large serving bowl and add diced veggies and seafood. Mix well, add some salt and pepper and continue to fold in well. Add lime juice and once again mix well. Let your food sit for a minute or two and stir again, repeat this a few more times before it’s covered and chilled. 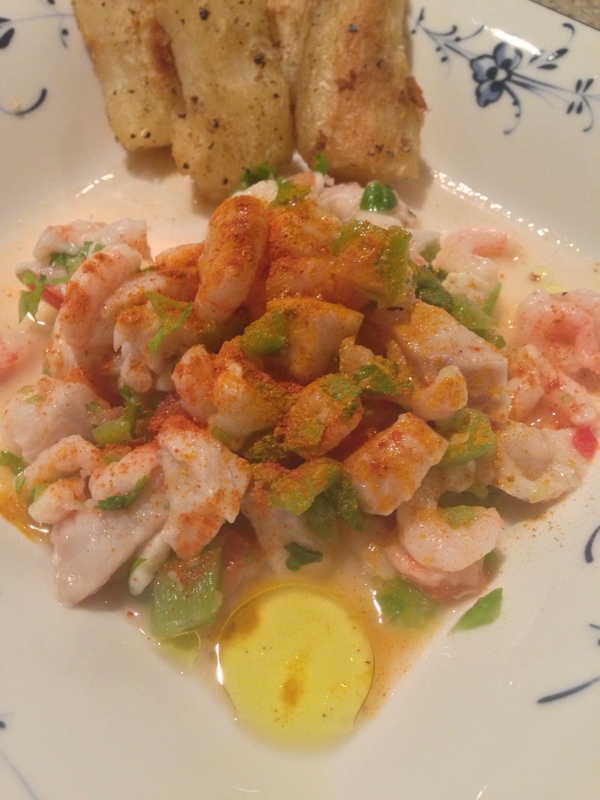 The extra mixing allows for the lime juice to cook the seafood evenly, and tt will make all the difference in taste. As you can see we served ours with some Yucca. Enjoy this dish this summer, it’s easy and it’s refreshing. I had no idea what Cerviche was…I had only heard it before in that movie with Katherine Heigl “The Ugly Truth”. The restaurant scene…..with the novelty underwear…..haha. Hope you have seen it or this comment makes noo sense. Anyway at the end of the scene someone asks whats in Cerviche. Thanks to you….now i know!! Looks absolutely delicious by the way! I’d never heard of Ceviche before. This looks & sounds delightful .. will forward it to my hubby (the culinary guru in our family). Thanks for sharing!